Are surfactant-free neutral cleaners the future technology? For Industrial component cleaning, a large number of different cleaning concepts are implemented around the globe. Most recently, surfactant-free products have been introduced with great success. It is high time to have a closer look at their application characteristics in comparison to traditional surfactant-containing products and to carry out a detailed evaluation for the potential user. For more than 25 years, salt-free neutral cleaners have been used on a large scale for industrial component cleaning: in first stage, interprocess and final cleaning applications. Product usage takes place most commonly by spray, frequently combined with dip, flood-immersion or ultrasonic applications (P1). 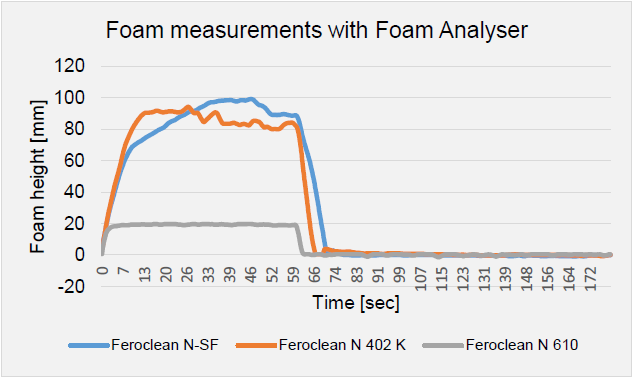 Surfactant-based neutral cleaners tend to foam at application temperatures below the cloud point of the surfactant package, especially in spray applications. At temperatures above the cloud point they may be considered as low-foaming but they do not work completely free of foam. For true low-temperature applications in the range of 20 to 40°C they often are not considered due to their limitations. The new surfactant-free neutral cleaners are characterised by extremely low foam generation even at ambient temperatures. This now also makes them relevant in high pressure deburring operations, but also in ultrasonic applications or for bath maintenance by filtration techniques where foam is highly undesirable . 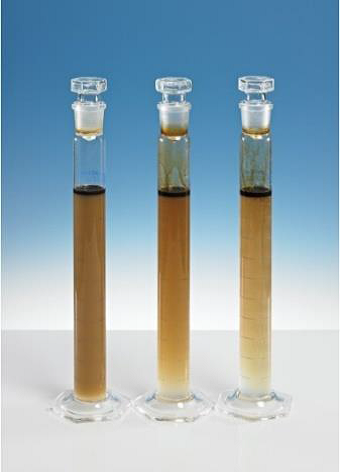 Separation of oils via skimmer and settling tank etc. Products without labelling are being preferred universally. 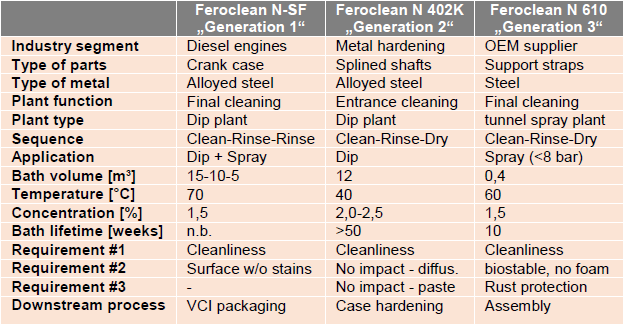 The current article takes up the topic of different neutral cleaner generations (P2) and provides an evaluation of various cleaner concepts. The test methods applied and the results achieved for the aforementioned neutral cleaners are described in the following sections. 2g of iron chips are placed onto a filter paper and soaked with 2g of cleaner solution for 2 hours at ambient temperature. After removal of the iron chips the filter paper is rinsed and dried. The degree of rust is evaluated by comparing the filter with standard pictures for the grades 0-4 (0=no corrosion, 4=strong corrosion). 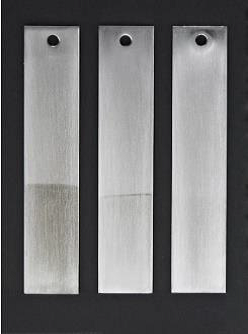 Several cleaner concentrations and water hardness values have been tested. The results are summarised in Table 2. It is obvious that the generation 2 und 3 products provide excellent temporary corrosion protection even at low product concentration of 2% and in city water of 20 dGH. The generation 1 product is inferior in that respect and cannot compete. 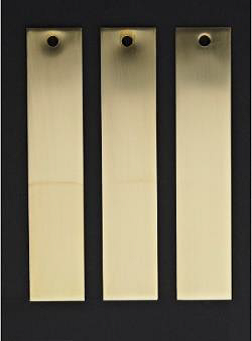 Metal strips made of aluminium, copper, brass and zinc are cleaned and polished and subsequently partly immersed in a 3% neutral cleaner solution in demineralised water for 10 min at 50°C. After rinsing and drying, the metal strips are evaluated visually. A weak attack onto the metal surface is shown by a discolouration at the three-phase boundary, a significant attack by a discolouration on the entire surface. As a result, the generation 1 product proves a limited multi-metal capability for components made of light and yellow metals. For cast zinc parts the generation 1 product is completely incompatible. The generation 2 and 3 products are equally compatible with all tested substrates. Slight discolouration, if at all, may be observed on zinc surfaces (P3). 100 ml of a 3% cleaner solution in demineralised water of 20°C are transferred into a measuring cylinder and mixed thorougly. The foaming behaviour is evaluated immediately after shaking the measuring cylinder. The results of the shaking tests for the neutral cleaners investigated are shown in P4. Both surfactant-based products show a distinct tendency towards foaming whereas the surfactant-free product does not foam at all. The qualitative results obtained in the shaking test has been further quantified by means of foam measurement with the Foam Analyzer DFA 100 from Krüss. 20 ml of a 3% cleaner solution in demineralised water are filled into the Foam Analyzer DFA 1000, heated to the preset temperature of 50°C and then purged with air for 60 seconds. The build-up and breakdown of foam is tracked by means of an LED light and light sensor. It has shown that the surfactant-based neutral cleaners produce 90-100 mm of foam height, which is about five times more compared to the surfactant-free product. Also, the foam breaks down much slower than in the latter product. For the surfactant-based products it takes about 15 seconds for the foam to reduce to 3% of the peak value, whereas it takes only 3 seconds in case of the surfactant-free product (P5). Consequently the qualitative results from the shaking tests are fully confirmed by the measurements with the Foam Analyzer. 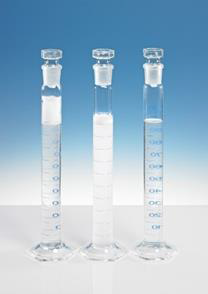 100 ml of a 3% cleaner solution in demineralised water of 20°C are transferred into a measuring cylinder. After the addition of 2% hardening oil: Isorapid 277 HM, the phases are mixed thoroughly. The demulsifying property of the neutral cleaner solution is evaluated visually after 30 seconds and 5 min. 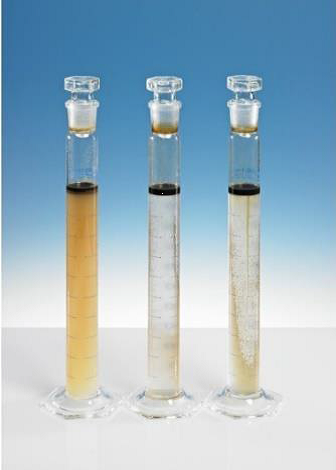 As a result, the generation 2 and 3 products exhibit significantly better demulsifying properties for lubricants and oils compared to the generation 1 product (P6). In practical applications, excellent demulsifying properties are important for avoiding re-contamination of the cleaned components. 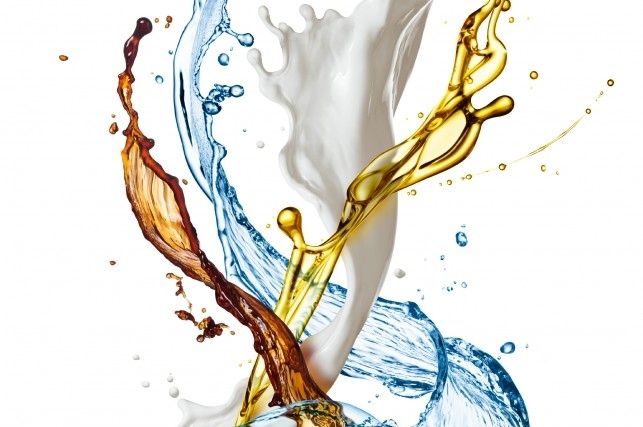 In addition, the emulsifying/ demulsifying properties play an important role with respect to the separation of oils via skimmer and settling tanks, hence affecting the lifetime of the cleaner bath. 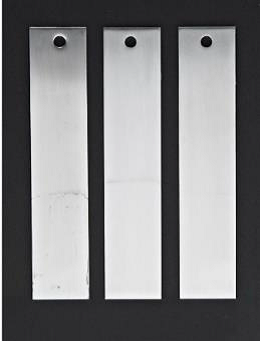 For minimum cleaning time measure-ments, a 3% cleaner solution in demineralised water is transferred into a 90L GS spray washer.Then 7.5x15 cm cold-rolled steel panels supplied from Q-Lab contaminated with oil of approximately 5 g/m² are sprayed for increased periods of time in measured steps. After each spray cleaning cycle the panels are rinsed with water and the wetting properties are evaluated after draining for 30s. 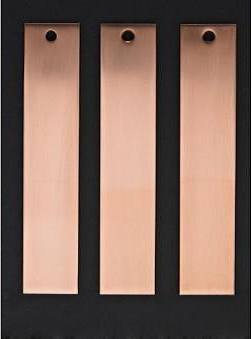 The minimum cleaning time is reached when >95% of the steel panel area exhibits a water break-free surface and the water film pulls back slightly from the cut edges. 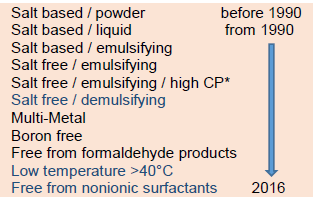 The minimum cleaning time for spray application at 60°C for various mineral oil based industrial products are summarised in Table 3. A minimum cleaning time of <10s has been observed in all cases. Therefore a distinction between the neutral cleaners investigated is not possible. 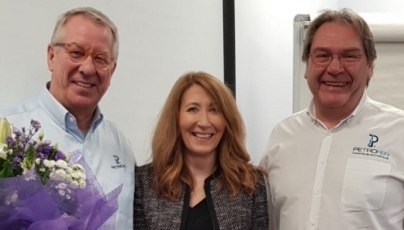 The results show that the removal of oily contaminations takes place fairly rapidly and hence is not an issue in practical applications where typical treatment times are in the range of several minutes. Typical applications of the three neutral cleaner types investigated are summa-rised in Table 4. 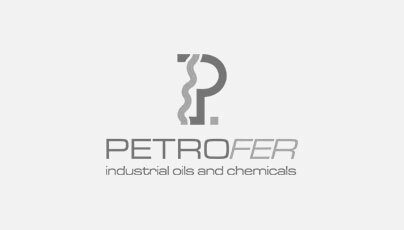 The quality profiles of the products determined under laboratoy conditions with respect to cleaning performance, multi-metal capability, foaming behaviour, demulsifying properties and temporary corrosion protection are fully in line with the practical experience made in industrial applications. 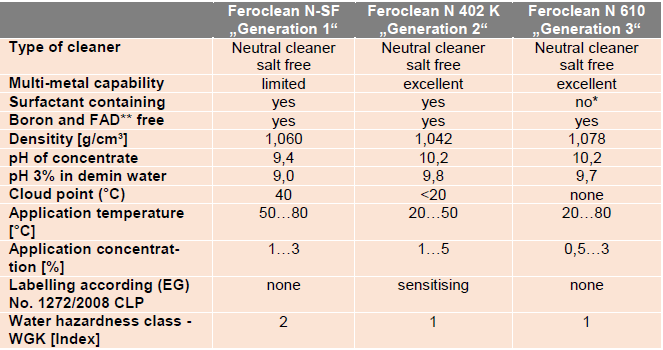 The comparative tests show that neutral cleaners of earlier generations may still be used for standard applications, i.e. applications where multi-metal capability, low-foam properties and high temporary corrosion protection do not play a major role. The generation 2 product takes an inter-mediate position, but gets very close to the surfactant-free product in various respects. It cannot compete, however, with the low-foam properties of the latter. Where excellent temporary corrosion protection, full multi-metal capability, reduced bath temperature and zero-foam properties are required, the surfactant-free neutral cleaner of the latest generation will be the product of choice. 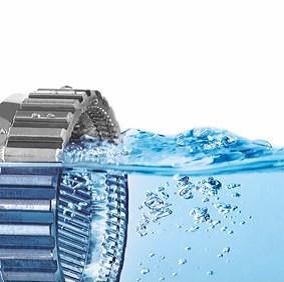 Further product advantages exist with respect to ultrafiltration (no drag-out of surfactants), the suitability for high pressure applications such as high pressure deburring (currently tested up to 2000 bar), the extremely low consumption and the markedly increased bath life. Through the use of this product type all current tasks in industrial component cleaning can be covered as well as the exploration of new applications.